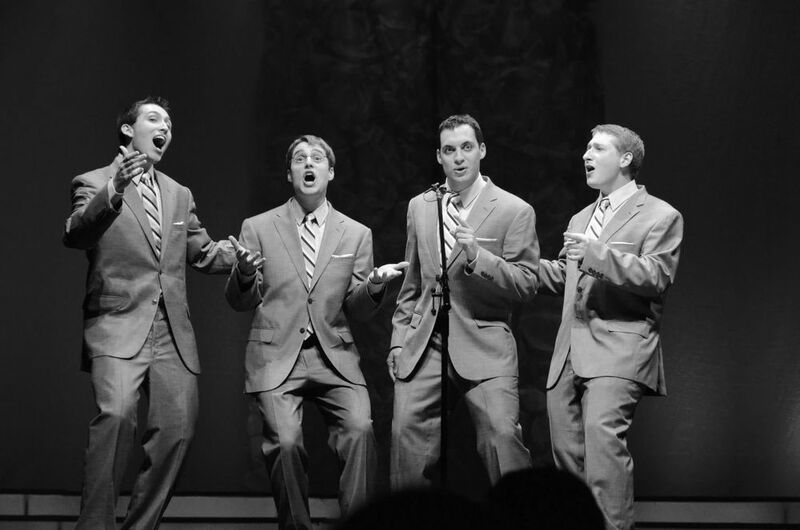 The quartet is heavily involved in youth outreach and music education through barbershop singing, having coached students across the tri-state area in multiple different venues. The quartet has achieved great success in barbershop contests as 2018 Mid-Atlantic District Quartet Champions and finishing as high as 14th internationally. The quartet also had the enormous privilege of being featured at the legendary Rainbow Room at Rockefeller Center in NYC alongside James Langton's New York All-Star Big Band in 2015. Gimme Four continues to sing with the Big Band, appearing on The Intrepid, at the Algonquin Arts Theater, and at the Cutting Room in NYC. In 2017, Gimme Four opened for Jay Leno at The Freeman Stage at Bayside in Delaware and toured St. Petersburg, Russia, which are the most recent in a long string of unique and extremely fulfilling ventures. In 2018, the quartet was very proud to release their first album, "Gimme Four: Volume I", which is available now on this very website. The quartet loves to compete, loves to teach, loves to coach, loves to work, and loves to make friends, but more than anything else, loves to make music that leaves a lasting impression - one that changes someone's day, and maybe even their life. PAUL FRANEK is the tenor of Gimme Four. Paul was introduced to the genre though his high school a capella group, the Retromen. Paul is incredibly passionate about barbershop, and serves as the presentation coach and tenor section leader for the Dapper Dans and East Coast Sound. When Paul isn't barbershopping (which isn't often), he's playing video games or ranting on about Android phones. Easily the most annoying member of the quartet. JOE SERVIDIO sings baritone in Gimme Four. Just like Paul and Dave, he learned of barbershop while singing with the Retromen and was invited to Dapper Dans rehearsal. Joe currently serves as the baritone section leader of the Dapper Dans and East Coast Sound. Joe also comes to the quartet with previous quartet experience, having sung with no fewer than four chapter quartets, most of which competed at M-AD Northern Division contests. DAVE AMMIRATA sings lead in Gimme Four. Like Paul, he learned of barbershop when he was singing with the Retromen in high school. Dave is the only member of Gimme Four who comes to them with previous international quartet experience, having competed in 2010 with his first quartet, Steel City Incline. Dave is also the co-director and lead section leader of the Dapper Dans as well as the director and lead section leader of East Coast Sound. Dave works in the audio-visual field for ACIEM Studios in Montclair, NJ. WILL DOWNEY is the bass of Gimme Four. He comes to the quartet with a wealth of musical experience. Will also sang with the Retromen, but did not come to the Dapper Dans from there like Paul, Dave, and Joe. Instead, in 2011, he invited himself to a Dans rehearsal and fell in love with the genre. Will serves as bass section leader, Music VP, and co-director for the Dapper Dans, as well as bass section leader, Music VP, and assistant director of East Coast Sound, and now directs the Retromen, the very group that got each quartet member started. Please check out both of the chapters that we represent and lead!